Cutting tools, shaping tools, measuring tools, layout tools, hand tools, shears, scissors, snips, scraping tools. 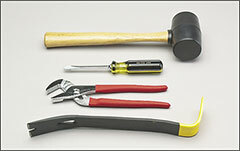 Other hand tools are shown on these pages: Trowels , Squeegees , Spreaders , and Palette knives, spatulas . Misc. knives and also Utility knives in fixed blade or retractable blade styles. Tape rules, diameter used to measure the circumference of tanks and pipes. Tape rules, regular used for linear measurements.